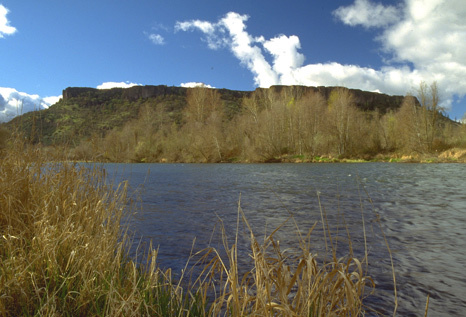 The Table Rocks are two of the most prominent topographic features in the Rogue River Valley. These flat-topped mesas rise 800 feet above the north bank of the Rogue River between Sam’s Valley and Central Point. Though many people assume Upper Table Rock is taller than Lower, the Table Rocks are actually named for their relative positions along the Rogue River, Upper being further upstream than Lower. Unlike the surrounding rounded hills in the valley, the Table Rocks have flat-topped summits that abruptly drop to meet the valley floor below. The elevations of both Table Rocks are just over 2,000 feet above sea level and both have a horseshoe shape. Approximately 7 million years ago, a shield volcano near Lost Creek Lake erupted and spread andesite lava over much of the valley. The easternmost exposures of the lava flow are east of Prospect in the High Cascades, while the westernmost exposure is found on top of Castle Rock, just west of Lower Table Rock – a distance of 44 miles. The thickest remaining portion of the lava flow is 730 feet thick and is located near Lost Creek Lake, while the western edge of the flow is 150 feet thick at Castle Rock. Over the past 7 million years, the ancestral Rogue River meandered through the valley, wearing away most of the andesite lava cap and the underlying Payne Cliffs Formation. Approximately 90 percent of the original Table Rocks lava flow has eroded away. In addition to flowing water other erosional forces have contributed to breaking down the lava flow: water freezing and thawing in the cracks of rocks, the root systems of plants loosen soil and rocks, the acid released by lichens breaks down rocks, and wind. Erosional processes continue to shape the landscape and break down the Table Rocks. 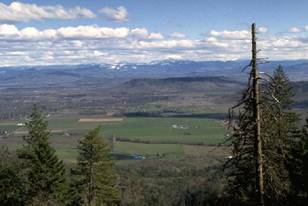 It is likely someday Upper and Lower Table Rocks will no longer be the prominent features in the Rogue Valley that they are today. BLM and The Nature Conservancy offer free interpretive weekend hikes during the spring months if you are in the area and want to learn more. Visit the website above for more information. Read more about the age, chemistry, and origin of capping lava at Upper Table Rock and Lower Table Rock in Oregon Geology.